I like to think I am a savvy traveler. I have done some great traveling here and abroad via planes, trains, and automobiles. I hydrate. I chat with interesting people. I can take my 2 year old on a four hour flight successfully with nothing more than one bag and an iPod full of Billy Joel, Jimmy Buffet, Coldplay and The Eagles (they are a recent addition). Then why do you suppose that our check in to Cabo last week had me sweating bullets? Oh, let me share. JohnnyMac and I take our son, his golf clubs, and 5 suitcases to the airport. We are early, we are stress free, we are delighted to be going to Cabo. After all, there has been many detours for JohnnyMac as you may recall. This time there are no obstacles. Curbside check in can't fully process us because JohnnyMac's passport, while still valid, expires in June. Matters not right? We will be back from Cabo before June. Oh, I am sorry? What did you say? 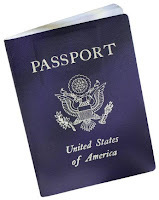 Passports have to be valid for three months after your return? Uh oh. The curbside agent takes us inside to a special lane and we are told that yes, this is the rule. The scowl on JohnnyMac's face is beginning to grow. However, the ticket agent smiles at us, Mexico is an exception. SHAZAM. She prints his boarding pass, our little man's, and when I hand her my passport, JohnnyMac and I smile at each other. Until she tells me that the name on my passport does not match my ticket. Come again? She shows me the passport, and all I can say is, ohshit. I never changed my passport to my married name. And why did this not occur to me? Because I didn't change my name immediately when we got married years ago. AND because I went to Mexico last year. My accelerated thought process immediately bends and melds to determine what will happen next. I never changed my name on my Delta medallion member account until oh, a few months ago, which means I sidestepped this problem on previous trips. ohshit. The ticket agent explains to me there is a 150.00 fee to change my name and if she rebooks under another name, it might cancel the reservation. It is looking unpleasant. I literally tell JohnnyMac to go without me. Which he will not do. Which I will really, really wish he had done if I have to get in the car with him when he turns into Grumplesaurus Rex. If we now can't go to Cabo because of me, I will hide for a week. Eureka! She offers to change the name on the ticket so it matches my passport. AND, she will waive the fee. Beautiful. So I offer her a 20.00 Starbucks card I had in my wallet. We are going to Cabo. Vamanos! My passport won't be an issue once we land because we aren't presenting tickets so nothing will need to match. I do tend to have great luck and I was thrilled we sidestepped a potential issue that could have been a show stopper. Oh, and JohnnyMac's luggage was missing for FOUR DAYS but we got that back too. Trying to track down a missing bag in Cabo San Lucas is similar to finding Weapons of Mass Destruction. As in, they are both things that are not going to happen. So, we are full on enjoying vacation until the morning before our departure, I woke with the slightest bit of angst. What if I could not get back on the plane? I asked JohnnyMac what he thought and because it was prior to 7 am, which is not a pleasant time to talk to JohnnyMac I might remind you, he wasn't as helpful as I dreamed he would be. It occurred to me to call Delta (since we had called them every day looking for the bag, I felt a kinship.) And when I called, I was told that not only did the ticket agent in Atlanta NOT change the name on the ticket, there was nothing that could be done on this end. I quickly assessed my next move. You don't play heavy in Mexico because it won't work and almost everyone you meet is the sweetest, nicest person on earth. So, I ask her worst case scenario is buying another ticket? (Same day, one way ticket purchase? $1500.00 plus tax). And she told me the flight was full. The one flight per day flight. Hmmm. I thought of JohnnyMac getting on a plane by himself with our 2 year old. I laughed. But only on the inside because I needed to do serious damage control on the phone. I told her I was traveling with my tiny son and I would basically cry if I couldn't get on the plane. She asked if I had my marriage certificate with me showing my name change. Along with things like a lawnmower, and a live gerbil, my marriage certificate is another thing I NEVER travel with. Thankfully she made some phone calls and it turns out because I already flew half the ticket, they would make an exception. They would make a note in the record and hopefully things would be fine. Hopefully. Hmmmmm. Hopefully is nice. However, based on the shenanigans with the bag, we learned that what someone tells you on the phone doesn't matter to the person you are speaking to live. So the morning of our flight, I have enough frenetic energy to launch a rocket. I literally crack open a Pacifico at 10 am. I do not drink at 10 am. Its called "Let's have a cocktail" not "Let's have a cocktail at the crack of dawn" but it soothed a nerve or two as I tried practicing taking about 100 deep breaths. I could always buy a ticket but the headache involved, especially on a mistake that could have been avoided, well, missing details is not exactly my style. We get to the airport, and they processed our documents without a care in the world. LOVE IT! All tucked in the plane, little man listening to Boom Boom Pow, I looked at JohnnyMac and said, "See? I don't even know what you were worried about!" Aye Carumba. But I have already printed off the requisite documents to correct this little error. Now that the wedding craziness is finally over and done with, I can get back to reading your fantastically hilarious blog! I'm glad you made it to Cabo and back, despite all the mishaps! I'm working through my list of name change to-do's now, and the passport is definitely near the top, given my penchant for international travel. And I certainly agree that pretty much everyone in Mexico is the sweetest person on earth. Our honeymoon was fabulous, and each person we met was so incredibly nice! I miss Mexico already. Let's go back!